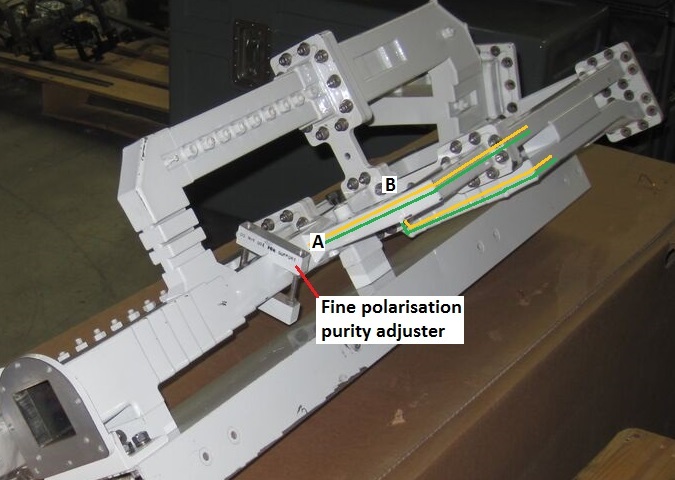 Explanation and description of a C band circular polarisation feed system. This page is based on an image of a top quality C band circular polarisation feed, as used in large earth station teleport antennas. Image provided by NewEra Systems Inc, who had the unit for sale in May 2016. It operates in dual polarisation on both transmit (6 GHz) and receive (4 GHz) frequency bands. It provided high polarisation isolation across the full bandwidth of both frequency bands. It has 4 ports, two receive waveguide ports for 4 GHz and 2 transmit ports for 6 GHz. Its connection to the antenna is via a short, separable, square to circular transition tube. The connection to the antenna is a circular waveguide flange. At the bottom left of the image is a short length of detachable waveguide with a circular flange at the front end (to go to the tube connecting to the feed horn) and a square flange at the rear end to go to the illustrated square aperture. Consider the receive signals which arrive and how down the square hole. Each polarisation, LHPC Left Hand Circular Polarisation (LHCP) and Right Hand Circular Polarisation (RHCP) comprises signals present on both linear polarisations. 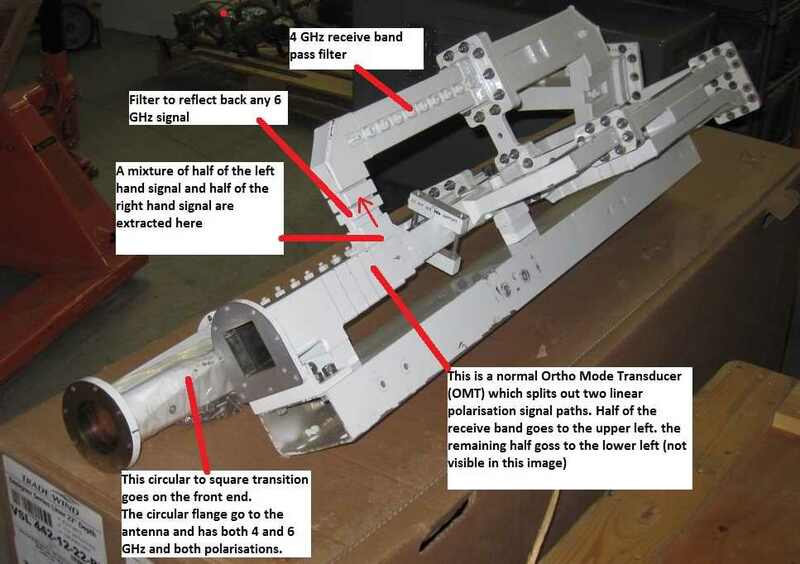 There is an Ortho Mode Transducer (OMT) which separates the two linear polarisation, similar to the OMT on a simple VSAT feed, except in this case both side arms are the same size waveguide and both carry the 4 GHz band receive signal. The amazing thing is that both arms are now carrying half of the RHCP and half of the LHCP signals mixed up together. One of the side receive waveguides is visible at the top. There is a short transmit reject fiter close to the OMT which reflects back any 6 Ghz signals into the main central tube. The distance of the 6 GHz reflection point in this filter to the central tube is critical so that the returned signals add up in phase with those already in the guide. The side apertures thus become effectively short circuited and invisible to 6 GHz. Along the top there is a filter which I presume is additional receive band pass filter, 3.7 - 4.2 GHz or possibly 3.625 - 4.2 GHz. I don't know the spec for this particular feed. Looking at the other side the two linear polarisation receive waveguides are clearly visible. I have marked the signal paths in red. Remember that each red path carries a combination of half of the RHCP and half of the LHCP signal. At the back end is where something rather clever happens. 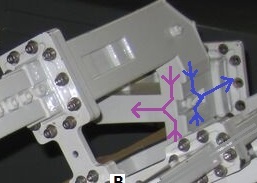 The two output waveguides, at the far left of the figure are at 45 deg to the two receive side paths. All merge together at a single magic Tee type joint marked "the clever bit". This image shows where the magic occurs. The effect is to merge the two RHCP signals together to make a full power RHCP signal and similarly for the two LHCP signals to merge and produce a single full power LHCP signal at the other outlet. The output waveguides are at right angles to each other but the pair are offset by 45 deg from the transmit system and the base plate. Quite how the blue and purple paths become separate is beyond me. If someone can explain, there is room here ... to insert some text. Help please !. You may now connect your pair of LNAs or LNBs or, more likely, a switching system with 3 or 4 LNAs/LNBs for redundancy. The transmit inputs are via the pair of smaller 6 GHz waveguide flanges at the back. I have marked the transmit signal paths in green and yellow. the two waveguides are separated by a solid looking pad which I think is a 3 dB coupler, where half of each signal crosses to the other side, going via the routes shown. The result is the RCHP and the LHCP signals are mixed up half and half, ready to be directly connected into the feed tube at right angles to produce circular polarisation. The upper side transmit path continues forward, then inwards and sideways "A" into the central feed tube. The other, lower guide in the image, angles underneath at the back end of the feed tube and does a quick twist, rises up and joins directly "B" into the back of the feed tube as horizontal polarisation. Having got both lots of mixed RHCP and LHCP into the tube we now have circular polarisation without the need for a polariser. The composite transmit signal then goes along the smaller square waveguide in the middle of the image. There is an interesting addition here. A small adjustable clamp has been added across the corners of the square tube. This may be adjusted (or repositioned across the other pair of corners) to tweek the transmit polarisation purity. Don't adjust this if you don't know what you are doing !